Qingdao, China was the location for the lively and informative 2nd International Conference on Clean Energy Science (ICCES2), with lectures from key figures from around the world. 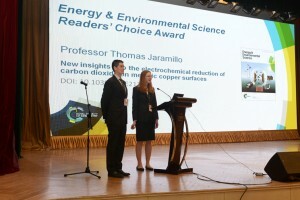 Energy & Environmental Science were delighted to present Professor Tom Jaramillo with the Energy & Environmental Science Readers’ Choice Lectureship Award at the event, and Prof. Jaramillo’s talk presenting insights on how to design a sustainable and efficient catalyst for CO2 reduction was very well received. Prof. Jaramillo was awarded the lectureship for his EES article “New insights into the electrochemical reduction of carbon dioxide on metallic copper surfaces” which was one of the most downloaded articles in 2013. To keep up to date with the latest published articles in Energy & Environmental Science, and our news and related events, sign up to our EES e-alerts and news service: http://www.rsc.org/Publishing/Journals/forms/V5profile.asp.